Just a few years ago, the thought of dying our hair grey or silver on purpose would’ve sounded almost absurd. 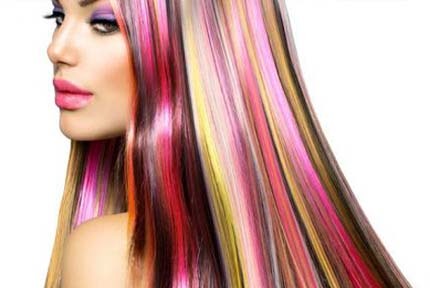 Nowadays, the color is on-trend, and one of the hottest looks one can rock on their locks. One of the reasons why, is that it’s so difficult to get the perfect shade. Obtaining one of the best grey silver hair dyes, of course! We’ve got them all right here, so let’s get started! 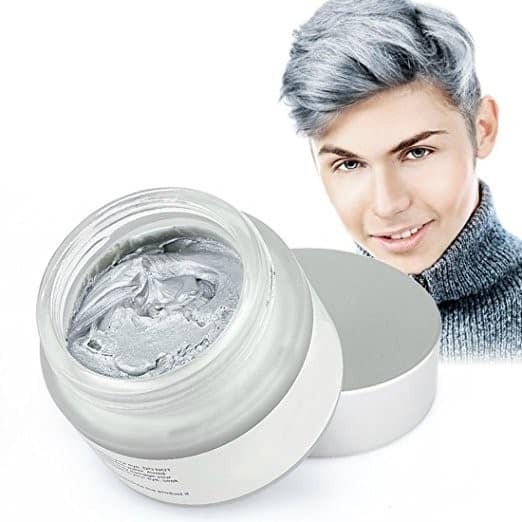 Now that you’ve had the chance to do a quick overview of all of the best silver-grey hair dyes, you’re probably curious to read more about some of them. For in-depth, unbiased reviews of these dyes, scroll down further! 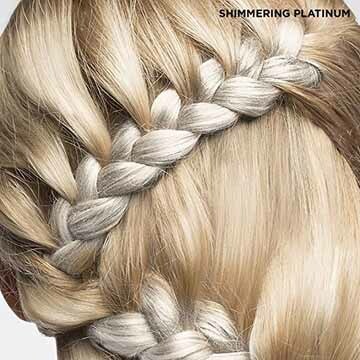 Easily one of the most popular permanent silver hair dyes out there, the Pravana Chromasilk Vivids (in silver) has a lot to offer. So, we stocked up on a couple of tubes. The price is one of the most affordable out there, however, you may have to spend a bit more, depending on how long or how much hair you actually have or actually want to color. So, what does it look like before it touches the hair? Well, right away, you can tell that it’s overwhelmingly very dark, vivid purple. It’s actually so heavily pigmented, that we didn’t really need as much as we thought, so keep in mind you may have a lot of product left over. The product itself isn’t very thick and creamy like some of the others we’d tried, and thank goodness it wasn’t very watery, either. The texture was very consistent and easy to work with. It applies easily and covers a good amount of surface area when applied to the hair. It practically glides over the strands, so you don’t have to work too hard to cover your entire head. The part we didn’t like? The smell. While we don’t expect hair dyes to exactly smell like roses, the scent of this one was just super strong, so make sure you’re doing this in a very well-ventilated environment! So, how did it end up looking? Great! Except for the fact that it is very purple after you first apply it. You’re probably going to end up with a dark purple/dark grey look for the first few washes, however, after that, you’ll start to see the more true gray/silver look. Overall, for the price, ease of use, and product quality, this one was definitely one of our favorite grey hair dye brands. 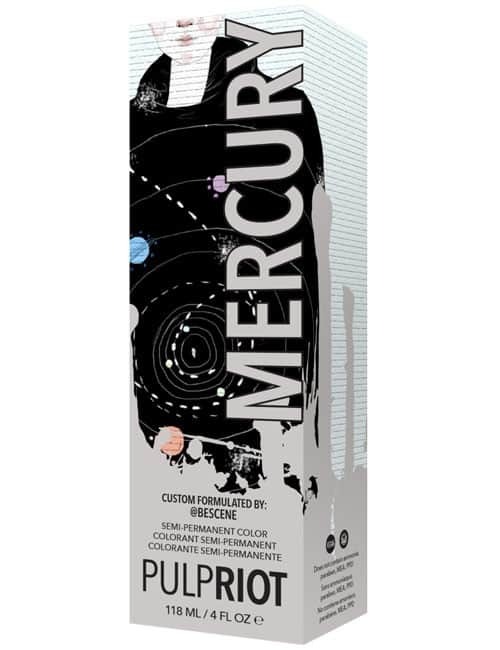 Consistently toted as one of the best silver hair dyes out there, the Pulp Riot in Mercury is definitely one-of-a-kind. Whether you decide to use it on its own or blended with some other colors, it consistently has been shown to look amazing. Not only does it work to dilute other colors, but it also helps give a slight iridescent/metallic look to any way you use it! Just make sure that you’ve already lifted your hair to either a level 9 or 10. That’s not to say that it won’t work on darker hair at all, but we can’t guarantee it will. The shade itself, we noticed isn’t just a pure silver that you’d imagine. It has a violet/blue base, so be prepared for that to show once you’ve applied the dye throughout your hair. It will come out a more blueish silver, and if used in combination with other colors, will give them a deeper, smoky look. Overall, it’s quite easy to apply. It only takes moments for it to be applied all over the head, and the consistency is solid, but not too thick or unmanageable. That it’s vegan and gluten-free! Not only that, but it’s also free of ammonia, parabens, PPD, and MEA. Not only is this great for those with chemical sensitivities, it’s great for the planet, the animals, and us! Looking for ways to get silver hair at home but aren’t sure if you want to commit 100%? That’s okay! Coloring your hair a new color can be a scary thing, and silver is definitely not one of those colors you want to do if you aren’t 100% sure about it. 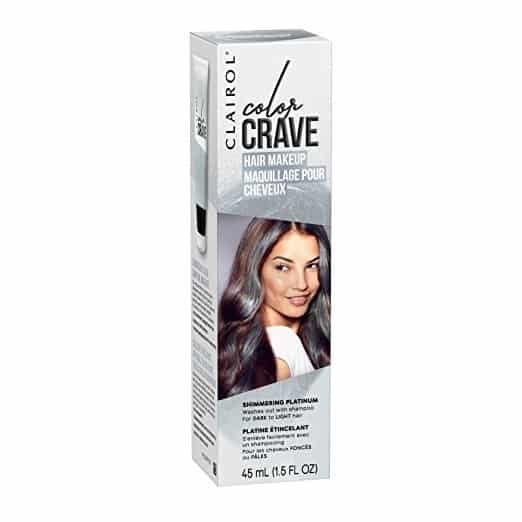 The Clairol Color Crave Temporary Hair Color Makeup, in Shimmering Platinum, of course! The color is ultra-temporary, and washes out in just one or two washes. This is a great option if you’re just trying it out to see how it looks on you, or if you have a one-day event where you’d like to spice things up with something unique and on-trend. Worried that it won’t work with your hair? Don’t be. It works with all hair types and textures, no matter if your hair is very coarse, thin and silky, or somewhere in the middle. It’s visible with literally any color; even the darkest brunettes! It’s one of the few grey silver hair dyes that actually work this well with any hair type or color, so it’s super versatile. Their exclusive micro-crystal formula works to reflect light, which is what gives you instantly visible color, no matter how light or dark! The formula itself, contains no ammonia, peroxide, or parabens, so the damage-free formula is very gentle for those who are concerned about that. The application process is very simple, and one of the most precise that we’ve come across. It features a precision sponge applicator for quick, easy, and of course precise, styling. You can easily choose to do your full head, just as well as certain pieces for endless, unique looks! It doesn’t matter, because you have no commitment to worry about! Well, perhaps also that it’s temporary. If you’re looking for a more permanent solution, then you’ll have to go with a different product, as this one will be out almost guaranteed, the next time you wash your hair. Staying somewhere between wanting a one-time grey/silver experience and wanting it to last a bit longer? Then check out the Joico Intensity Semi-Permanent Hair Color, in Titanium. The color is one of the best semi-permanents we’ve seen, and features heavily concentrated pigments to allow for wonderfully vibrant color results. It actually surprised us how vivid and strong the color was, given the fact that it was only a semi-permanent. Not only that, but it leaves the hair in great shape, rather than damaging it! Thanks to their exclusive Quadramine Complex, it works to reconstruct your hair during the coloration process, so when you wash it all out, you’ll find your hair to look and feel healthier along with your new-found silver/grey hair! The Joico Titanium is a very blue-based grey, which means if you do have any kind of warmth in your hair (yellow, red, or orange tones), it’s going to mix with these and make your hair have a greenish tone. This is probably not what you’re going for, so make sure that you tone all of that out beforehand. 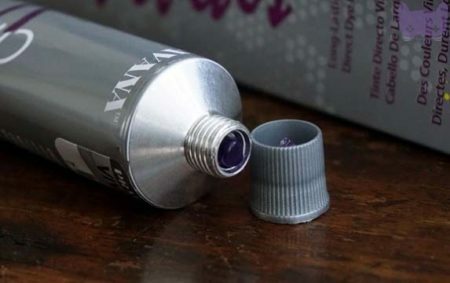 With that being said, we did notice that the purple was stronger than the grey, so if you don’t want that to be the case, you can easily customize it for a more grey/silver look, rather than just a greyish blue/purple. It’s just important to know this beforehand, as you will most likely end up with a purple grey otherwise. However, if you do end up with it, it’s not too big of a deal, as it fades into a beautiful silver/grey after just a few washes. On top of that, it’s an excellent budget product! It’s one of the least expensive we’ve found, and you don’t really require a ton of product for it to work. The consistency, number one. It’s super thick, and we actually had to use conditioner to make it easier to apply throughout the hair. If not, it can end up looking very chunky or uneven. In addition, it doesn’t last as long as your regular permanent silver hair dyes; rather only 2 to 6 weeks. Can you get grey hair naturally without using any hair dye at all? The answer is yes…if you have the Mofajang Hair Color Wax, that is. We had heard rave reviews about this hairstyle cream, and we knew we had to pick some up for ourselves to see if what we were hearing was true. The product is wonderful if you’re sensitive to chemicals, or just want something that’s not damaging to you or the environment. The actual formula, itself, is very simple, and isn’t packed full of chemicals and ammonia like so many other grey silver hair dyes are. Our first reaction was that it was more of a face cream consistency than the wax it claims to be. This was a pleasant surprise, as we imagine it to be much more manageable than a wax would be. How does it feel in the hair? At first, it made us a bit nervous, as our hair started getting sticky, but after blow-drying, the texture started feeling very thick, but had some kind of styling clay or cream in the hair. Our locks were pliable, yet gave it more life and body while adding some control. 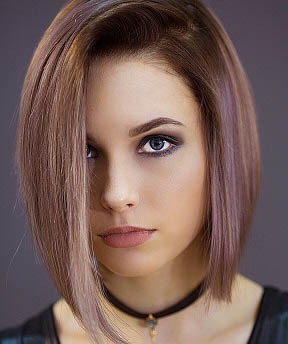 The end result is a very deep silver grey, making it perfect for changing things up for a special event, or trying out the color before committing to a permanent one. It’s great, because you don’t have to go through the trouble of lightening and toning your hair before like you’d be required to with a permanent shade. It’s also a great budget product, so if you don’t want to break the bank, check this one out. Before you use a permanent grey silver hair dye, keep in mind that typically, the process isn’t just a color-and-go. There is a lot that goes into making the color possible. First, you need to make sure that you deep condition your hair two weeks in advance, more or less. You need to make sure your hair is strong enough for the process. 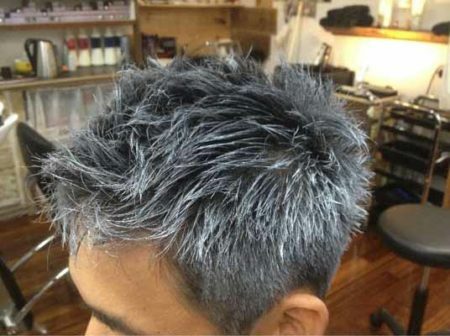 Next, you must lift the hair color to be light enough for the silver grey color to even come through. Tone it, as well. If not, you could end up with some very green-looking hair, and you probably don’t want that if you’re here looking for silver grey. Afterward, make sure you use upkeep to keep your color looking its best. Use a purple shampoo to keep the tone silvery, rather than brassy. This can easily happen over time, so it’s more of a necessity rather than just a suggestion. Also, decide whether you want something permanent, or something with less commitment. If you’re unsure, going with a temporary or semi-permanent color is never a bad idea. It’s almost like taking the color for a test drive and seeing how you like it before buying into it. 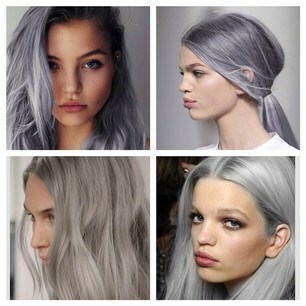 Now that you know pretty much all about the best grey silver hair dyes, which one ended up in your shopping cart? If you’re still having some doubts, don’t worry! Allow us to reiterate how much we absolutely loved the Pulp Riot dye! It was one of the few permanent colors that we actually felt was worth purchasing. Not only that, but it’s pretty affordable, so you don’t even have to shell out a lot of money to get a great look! The formula is easy to work with, and easy to apply evenly all over the head so you don’t end up having any spots or chunkiness. It’s quick and gives you deep, rich color results in just a short amount of time. It also looks better as it fades, which is not all that common. The formula itself is very safe to use, and is also vegan and gluten-free, which opens it up to a much bigger potential consumer group! If you have chemical sensitivities or just place more importance on the health of yourself and the environment, then this is a wonderful option to choose from. So, which one of these best grey silver hair dyes will be giving you the hair transformation that you’ve been looking for?